Ernest H. Dyck: missionary and church planter; born 5 April 1922 to Peter and Katharina (Toews) Dyck in Hierschau, Molotschna Mennonite Settlement, South Russia. He was the seventh child of his father’s second marriage and the youngest of eleven in the family. On 28 September 1951, he married Lydia Krahn (2 March 1928, Gilroy, Saskatchewan, Canada - 17 August 2011 in St. Catharines, Ontario, Canada), daughter of Heinrich and Maria (Klassen) Krahn, in Abbotsford, British Columbia, Canada. The couple had three children, all of whom survived childhood. Ernest died on 14 September 2009 in Virgil, Ontario,. Ernest was only four years old when his family decided to leave Russia and move to Canada. With the exception of his father, who had been killed shortly before, and his eldest brother, the family left for Moscow on 15 September 1926. In Canada, they settled first in Rosthern, Saskatchewan and then in Pincher Creek, Alberta, where Ernest began his education. In 1937, Ernest and his family moved to Abbotsford, British Columbia, where he studied at the Yarrow and Abbotsford Bible Schools. Ernest was baptized in July 1941 and joined the Mennonite Brethren Church in Abbotsford, British Columbia. After Bible school Ernest began his alternative service in 1945. He completed his high school diploma in 1947 at the Mennonite Educational Institute in Abbotsford and then graduated from a missions course in 1950 at the Mennonite Brethren Bible College in Winnipeg, Manitoba, and in 1951 with an Arts degree at Tabor College in Hillsboro, Kansas, USA. He also received a teaching certificate from Kansas State College in Emporia, Kansas. In 1951 Ernest Dyck married Lydia Krahn in Abbotsford, British Columbia. 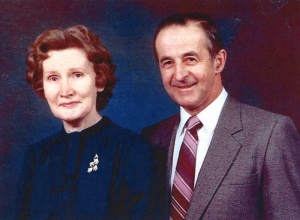 Ernest and Lydia attended classes at Bethel Bible School in Lennoxville, Quebec, Canada, where they studied French in preparation for working with the Congo Inland Mission in the Belgian Congo (later Zaïre, then the Democratic Republic of the Congo). In September 1953, they moved to the Matende Station. After a furlough in North America in 1958, the Dycks, together with their children, returned to the Congo to work in Matende and Kajiji. When fighting in the Congo made conditions unsafe, the Dycks were evacuated to Angola and then eventually returned to Canada. In July 1961, the Canadian Conference of Mennonite Brethren Churches sent Ernest and Lydia Dyck to work as church planters in St-Jérôme, Quebec. The Dycks held services in a chapel and worked in literature distribution, home visitation, evangelism and church planting in St-Jérôme, as well as St-Thérése, St-Eustache, St-Rose, and St-Laurent. Ernest was also involved in establishing Camp Péniel in St-Eustache in 1974 and the Institut Biblique Laval (now École de Théologie Évangélique de Montréal) in Montreal, Quebec, in 1976, where he was the president until 1980. In 1980, Ernest and Lydia Dyck went to serve at the Orchard Park Bible Church in Niagara-on-the-Lake, Ontario but returned to Quebec in 1982 to work in the St-Jérôme and St-Rose churches. They retired in 1992 and moved to St. Catharines, Ontario. Ernest and Lydia Dyck were dedicated missionaries and church planters whose commitment to service helped several congregations and communities in Africa and Canada to grow and thrive. Dyck, Ernest. Called to Witness. St. Catharines: Ernest Dyck, 2003. Dyck, Norman. "Lydia Dyck Biography." Personal e-mail (13 July 2013). GRANDMA (The Genealogical Registry and Database of Mennonite Ancestry) Database, 4.19 ed. Fresno, CA: California Mennonite Historical Society, 2005: #225309. Missionary Album of Missionaries Serving Under the Board of Foreign Missions, The Mennonite Church Conference, Inc. Hillsboro, KS: Board of Foreign Missions of the Conference of Mennonite Brethren Church of North America, 1954. Obituary. "Lydia (Krahn) Dyck." 2011. Web. 24 April 2012. http://yourlifemoments.ca/sitepages/obituary.asp?oid=526786. Penner, Peter. No Longer at Arms Length: Mennonite Brethren Church Planting in Canada. Winnipeg, MB and Hillsboro, KS: Kindred Press, 1987: 46-47, 103, 104-111, 113, 121. Available in full electronic text at: https://archive.org/stream/NoLongerAtArmsLengthMBChurchPlantingInCanadaOCRopt?ref=ol#mode/2up. Huebert, Susan. "Dyck, Ernest H. (1922-2009)." Global Anabaptist Mennonite Encyclopedia Online. July 2013. Web. 19 Apr 2019. http://gameo.org/index.php?title=Dyck,_Ernest_H._(1922-2009)&oldid=163587. Huebert, Susan. (July 2013). Dyck, Ernest H. (1922-2009). Global Anabaptist Mennonite Encyclopedia Online. Retrieved 19 April 2019, from http://gameo.org/index.php?title=Dyck,_Ernest_H._(1922-2009)&oldid=163587.